Renovated 85 sq. meter (915 sq. foot) two-bedroom, two bathroom loft, with dropscreen tv, remote-controlled lighting and sound, and a fabulous kitchen, in the Marais near the Place des Vosges, rue de Bretagne, Bastille and the Cirque D'hiver. 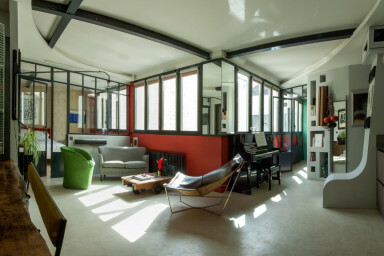 The apartment is situated on the second floor (with an elevator) of a late 19th century reconverted factory that was used to make the nuts and bolts for the Eiffel tower. The Entrance and stairwell have just been renovated. It has cream, polished concrete floors throughout, south and east-facing double-glazed windows which all have blinds that can totally shut out the daylight and design plaster ceilings with incorporated dimmable spotlights and Color LED lighting that is color-variable (by mixing yellow, blue and red). There are designer electric iron radiators for heating. The lighting can be controlled manually or by remote control, using one of the Ipads in each room. Fans are provided in the case of hot weather. The owner had the apartment converted with an architect and painstakingly chose the highest quality fixtures and fittings to make it an apartment that is both comfortable, practical and gorgeous, decorating it in an eclectic way with unique design pieces that are unique. The front door of the apartment opens to an entrance hall where you can store coats, shoes, hats and umbrellas. In front of you, there is a good quality upright piano from Schimmel which can be used (with care) by serious musicians who need to practice. To your right is a bedroom with a queen-sized bed that can be separated into twins if neccessary (please indicate that you will be needing this if you take the apartment, so that we can set it up for you) There is also some storage space for clothes and luggage. To the left of the entrance you have The large loft living space with a very large and well-equipped open kitchen which would be perfect for shooting 'Top Chef' and a dining space that is perfect for enjoying a wonderfully home-cooked meal. The dining table is a fabulously designed raw slab of polished limetree wood mounted on iron legs... Quite gorgeous, at which you can comfortably seat 6-8 people. There is a large refrigerator, separate freezer, a wine cellar, Nespresso coffee machine, a KitchenAid mixer, Magimix, a high-tech oven, an induction cooker and a dishwasher to wash it all up with when you've finished! The living area has a small comfortable sofa and two gorgeous designer armchairs around an unusual coffee table. There is a remote-controlled giant television screen that comes down between the master bedroom and the living room to watch cable channels or why not a film on the blueray disk player? The master bedroom is separated from the living space with 'atelier-style' windows that were made specially for the apartment. For intimacy, there are curtains that can be drawn. The master bedroom has a memory-form mattress that is seventh heaven. There is a wardrobe provided for your clothes (the owners dressing room will be curtained and inaccessible). There is a large, flatscreen television with cable connecion and there is a small desk and stool if you want to catch up with some work. On your left, just before you enter the main bedroom is the principal 'Hammam' bathroom, with its twin facing, variable rainshowers (with waterfall option), double stone sink and suspended toilet. The other bathroom is on the other side of the apartment and is also equipped with a sunken, variable rain shower, hydro-massage jets and designer toilet and sink. In between the second bathroom and the dining area, there is a small pantry/laundryroom equipped with a high tech washing machine and separate dryer made by Bosch. There is also a very convenient wireless iron and ironing board. We are happy to allow well-behaved pets, as long as they are restricted to the living area, never allowed on the beds and don't damage the furniture. The apartment is equipped with unlimited wifi internet access, free telephone calls to landlines in over two hundred countries throughout the world and cable television with some English news channels. You have access to all of the apartment except for a walk in closet in the main bedroom which will have a curtain behind sliding glass doors that will be blocked. (not visible in the pictures) We will provide a small wardrobe space in each bedroom for hanging clothes and shelves and drawers. We'll be happy to help out in any way we can during your stay over the telephone or directly at reasonable times and of course for any emergencies, we have a 24 hour number that you can leave a message on. This recently renovated 85 sq. meter (915 sq. foot) high-tech, two-bedroom loft apartment, is ideally situated in the Marais, just a few blocks from the Place des Vosges, the market street of rue de Bretagne, the Place de la Bastille and very close to the beautiful Cirque d'Hiver. You are in the best area for exploring the multitude of art galleries that are in the neighbourhood. If you're more of a clothes junky, you will also be spoilt for choice, with many of the up-and-coming younger French designers having their flagships in the area. Why not do some people watching, while sitting in a café on the rue de Bretagne? or explore the wonderful 'Merci' concept store with restaurant and café, just at the end of the street? And for foodies, there's definitely authenticity in the incredible foodshops and market produce that can be found in the neighbourhood. If you want to go further afield, all of the major monuments are a short metro or taxi ride away. We're right next to the metros station St. Sébastien Froissart, and also near the station Oberkampfs which both give you access to the whole of Paris. There are also numerous bus stops very close by. If you have allergies to animals, this apartment may not be suitable as we have two dogs that live there... Although be reassured, you will not smell them at all and the apartment will be well-cleaned.